Here’s a page I probably didn’t have to write, but what the heck I was on a roll 🙂 You can set a delayed release timer on the gag using this menu by clicking the plus and minus buttons on either side of the menu popup. The buttons on the left decrease the timer by the indicated amounts, the buttons on the right side increase the timer. 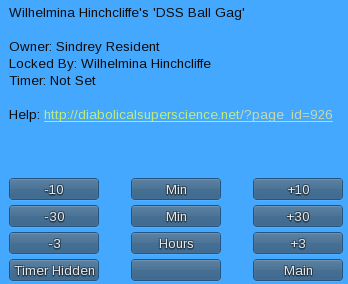 The [Timer Hidden] button lets you hide the timer setting from the wearer of the gag.